Only when you sit in a real race car and you’re properly “fastened” to your seat by safety belt and harness can you believe just how tight these things must be set in order to limit (or rather, prevent) body movement during violent cornering and braking during race or rally. 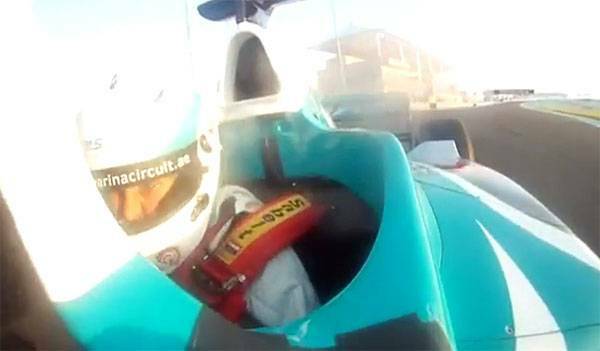 But the heroine of this video obviously did not have the privilege of being properly seated and “fixed” to the seat in demo F1 car on Yas Marina Circuit. This resulted in a wild ride in a passenger seat, full of very dangerous body movement and topped with the mandatory “faceplanting” each time driver hit the break pedal. Although this video is not closely related to rally, we thought it might serve as a reminder to all drivers and co-drivers in rally – if you can reach your time card left under the windshield – you are too loose. As author of this video suggests on Youtube, when you think you’re all set up and tightened – think (and check) again. See below how a ride in F1 car looks like with loose harness. Luckily, the passenger did not try to adjust it and risk making it even more loose. Next story iRally: Eurosport deal is off!